While the Trump administration applauds this week's progress in South Sudan's peace talks, it expects that ending nearly five years of civil war and rebuilding confidence in the eastern African nation's governance will be "a long process," the top U.S. diplomat there says. "We're excited about the progress made so far," said Thomas Hushek, U.S. ambassador to South Sudan. "And we're really hoping that the parties stick to their efforts to come to the table, compromise where necessary, uphold their commitments first and foremost to the cease-fire, and then start working on ways to resolve remaining issues of conflict" so they can sign a final peace agreement. 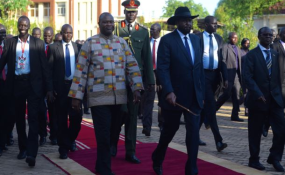 The peace talks are "at a very critical stage," he acknowledged in an exclusive interview Thursday at the U.S. embassy here with VOA's "South Sudan in Focus" radio program. On Sunday, South Sudan's President Salva Kiir and opposition leader Riek Machar signed a power-sharing pact that will restore Machar as the first of several vice presidents in a transitional government of national unity. Machar, who leads the Sudan People's Liberation Movement-in-Opposition (SPLM-IO), has been in exile in South Africa. Hushek said the U.S. government would take what he calls “tough measures” against people who either obstruct the peace process or divert public funds for war rather than peace. In September, the U.S. Treasury Department imposed sanctions on three people closely affiliated with Kiir for "their roles in threatening the peace, security or stability of South Sudan," it said in a statement. Three companies also were sanctioned. Asked what it might take to lift sanctions, Hushek said that if the transitional government rebuilds public confidence and proves itself trustworthy, "I think you would start to see some changes." South Sudan gained independence from neighboring Sudan in 2011. But ethnic violence erupted in 2013 over a power struggle between Kiir and Machar. The fighting has left tens of thousands of South Sudanese dead and dislodged millions from their homes. The United States, South Sudan's biggest single benefactor, has allocated $481 million in humanitarian funding for fiscal 2018 for refugees there and in neighboring countries, according to the U.S. Agency for International Development. It has spent more than $3.4 billion since 2013. For Hushek, "one of the first barometers" of peace prospects is "whether people are upholding the ceasefire," he said. "And, in fact, there's been a reduction in violence on the ground. "There are still other things that I'm a bit concerned about," the diplomat acknowledged. "I think recruitment is continuing into various militias, and that's something that doesn't necessarily bode well." As Hushek said earlier in the interview, "The ultimate yardstick of whether or not there is success in the peace process is whether they can set up a system that resolves conflicts through peaceful means, without resorting to arms." Hushek, a career Foreign Service officer, was appointed ambassador in May after serving as acting assistant secretary for the U.S. State Department's Bureau of Conflict and Stabilization Operations. VOA's Carol Van Dam Falk and Carol Guensburg contributed to this report.